What Browning's legacy will be is up for debate. But what should it be? 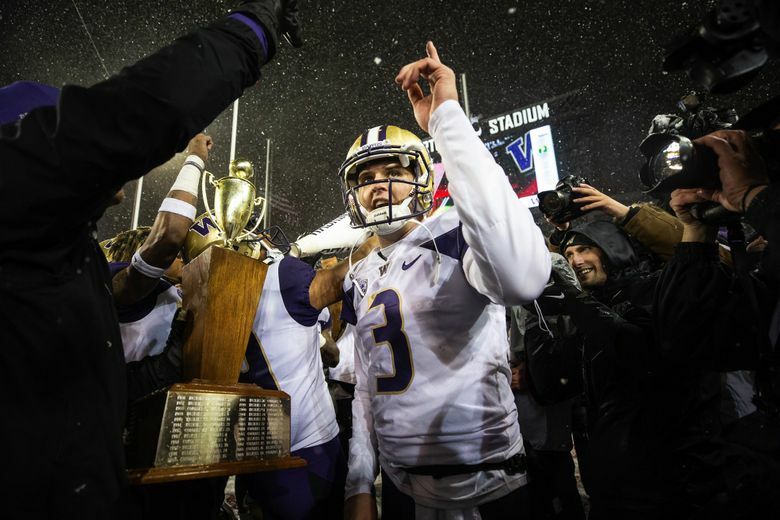 LOS ANGELES — The Browning Fatigue Factor has been a reality for Washington’s senior quarterback for some time now. Jake Browning has even coined a new name for it: Jake-lash. For one more game, he’s here. No quarterback in Washington history has played in more games than Browning, who will make his 53rd start on Tuesday in the Rose Bowl against No. 5 Ohio State. Browning’s 39 victories are a Pac-12 Conference record. He’s led the Huskies to two Pac-12 championships in three seasons. His 110 total touchdowns and 11,983 passing yards are UW records. And yet his legacy is a complicated one. He is, perhaps, a victim of the success he helped create in 2016, when the Huskies won their first conference title in 16 years and earned their first College Football Playoff berth. He hasn’t produced at the same level he did during that sophomore season (when he tied the Pac-12 record with 43 touchdown passes), or even come close to it (with 35 TD passes combined the last two seasons). And then, there are the big-armed, blue-chip quarterbacks waiting behind him, most notably Georgia transfer Jacob Eason. Browning is well aware of all that — of the strong opinions some fans have of him — and he has always had a healthy perspective on his role and his place in the program (even if he can be a little sarcastic about it at times). He says he has no regrets. And why should he? Others in and around the program have their own strong opinions about the quarterback, and about the fans’ backlash — Jake-lash — surrounding him. In the moments after UW’s loss at Stanford in November 2017, UW athletic director Jen Cohen admitted she “went crazy” on a Husky fan who was screaming expletives at Browning as the Huskies walked off the field. In this social-media era — when everyone has a forum to share their every thought on any given subject at any moment — Cohen said Browning’s handling of criticism is all the more admirable. “First of all, he’s succeeded a lot more than he’s failed. And his failures, as public as they’ve been, he’s picked himself up and re-motivated himself,” she said. Browning, for his part, avoids Twitter as much as possible. How Browning will be remembered is up for debate. How should Browning be remembered? Browning, out of necessity, has already started the process of moving on to the next phase of his life. He recently subleased his Seattle apartment and moved out all his belongings. Next month, he plans to start training in California ahead of the NFL combine. “I think, for me, I obviously loved my time here,” he said. “I have no complaints about it. But, you know, you kind of get to a certain point and you feel like your time has come, and I’ve played more football than really anybody.